Delivered to You with the Most Experienced Help in the Industry. 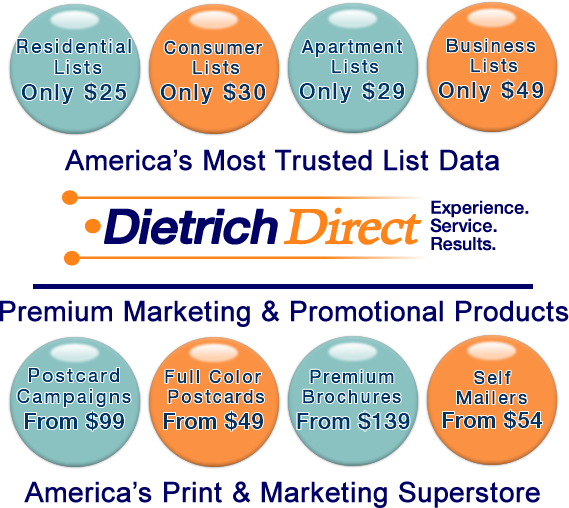 If you're looking for Low Priced, Highly Targeted Direct Mailing Lists, Postcard Printing and Mail Services, or, Document Outsourcing Services, DietrichDirect is the only company you need. At DietrichDirect, you'll find that our combination of experience, great service and results oriented approach are the keys you need to successful execution and management of your direct marketing projects. And most importantly, you can be assured we will always act in your best interest. A Full Service Mailing List Company, Direct Marketing and Customer Communications Agency - All Under One Roof. We are a full-service list company offering accurate, up-to-date lists and expert, experienced list advice. We conceive, create and produce Direct Marketing campaigns that generate qualified traffic and increase sales for our clients. We architect, develop and deploy Customer Communications programs that cut costs for our clients and enhance the customer experience. We maintain outstanding relationships with the very best list compilers and list managers in the list industry, and we have over 20 years of experience in virtually every facet of the business. With an intimate understanding of how the data is compiled, and an understanding of the Marketing challenge, we are uniquely qualified to recommend the right list. We are experienced commercial printers with leading edge digital & offset printing; a fully equipped bindery and an array of mailing services capabilities. We are highly fluent in the leveraging of internet technologies and leading programming platforms to enhance the effectiveness of your Direct Marketing and Customer Communications strategies. We have a keen understanding of the challenges that Marketers face, making certain that the delicate marriage of creative, audience, timing and execution all have one goal in common: to maximize your Return On Marketing Investment. We effectively bridge what Marketers want and what Technology can deliver. We speak both "languages" - and we do it well. But most important is the relationship that we forge with you. We're not here to simply serve you, we want to delight you...by delivering great products, great service, at a fair and reasonable price. And we believe we can do it better than anybody else. Shouldn't we be doing it for you? Give us a call. We're here to listen.